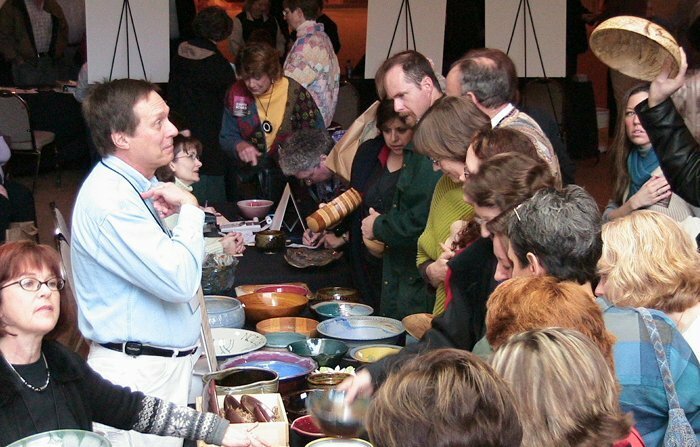 Empty Bowls is an annual fund raising event held by the North Texas Food Bank (NTFB) which is strongly supported by DAW. It is held in the Feb/March time frame, where top Dallas area chefs and restaurants provide gourmet soups, breads, and deserts to guests who contribute to the event. Proceeds from Empty Bowls go directly to NTFB. While guests at the Empty Bowls event receive an excellent lunch prepared by famous chefs, the high point for most attendees is getting to select one of the 3000 Empty Bowls created by local potters and wood turners. There is also the option for guests to upgrade, for an additional fee, from a group of select bowls. Or, they can trade up to a very nice piece in a silent auction. Most of the Empty Bowls are donated by Dallas area potters and members of Dallas Area Woodturners and Hunt County Woodturners. The wood bowls are very popular with the patrons. For any further information on the Empty bowls program please see Lou Boudreaux at the next club meeting.